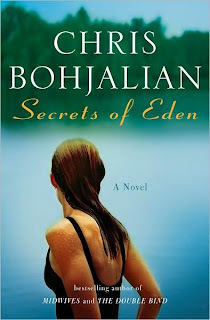 I began Chris Bohjalian's latest work, Secrets of Eden: A Novel, and will probably come back to it, so I wanted to jot down what happens in the first 25 pages so I don't have to re-read them later. Rev. Stephen Drew leads a small Baptist congregation in southern Vermont. The night he baptizes Alice Hayward, she is murdered by her abusive husband, a handsome and well-respected retailer who then kills himself. This horrific act not only makes the reverend's town notorious, but leaves the couple's young writer daughter Katie without parents. The husband, George Hayward "had come from Buffalo and saw that Manchester could use more than high-end designer outlets and shops that sold maple syrup." There's really not much compelling me to continue with this book, but it seems to fall into the straight-forward storyteller tradition of Richard Russo and Ethan Canin. It depends what jumps ahead of this book on my reading list, but Secrets of Eden is probably a good candidate for light beach reading if all this snow eventually goes away.